Honeywine on the left and a sweet red wine on the right. Sorry, don’t remember the proper name. Both were good. Actually, the honeywine was VERY sweet. I couldn’t help ‘Nita finish it. I loved the red one though. So, one of my LANDMASS girls took me out to dinner for my (belated) birthday. Sweet. 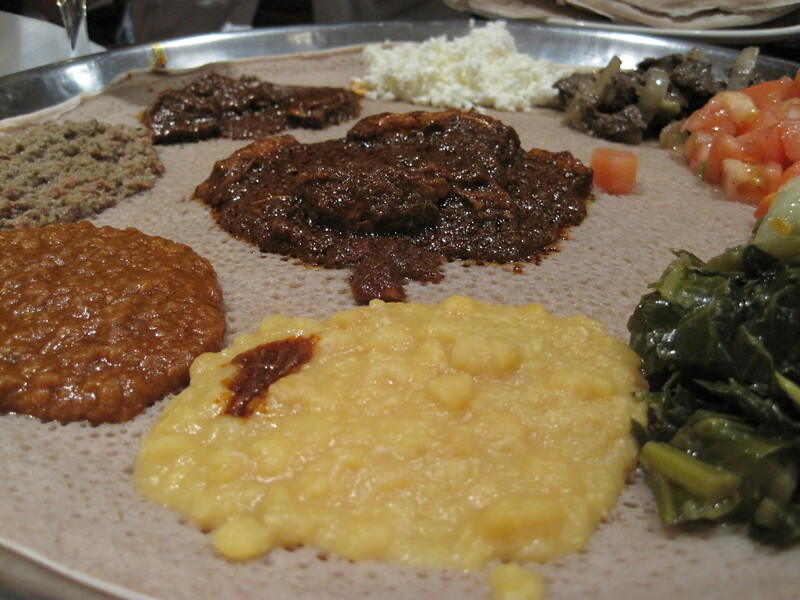 Dukem on U Street is one of the better known and appreciated Ethiopian restaurants in DC. I made the mistake of going here one Thursday evening when they had live music. O M G. The music was BLARING; so loud that we could not talk to one another. Good thing me and ‘Nita were out on a Saturday night. So, Anita was a bit nervous because her sister’s experience wasn’t exactly thrilling when it came to Ethiopian food. I think it was the bread. I prepared Anita by describing the bread as a slightly sour dough with texture similar to sponge. We got the Combination Platter for 2 people. It had the following: Tomato salad, collared greens, pickled cabbage, homemade cottage cheese, spicy Lamb Wot, spicy/mild Doro Wot (chicken), mild Minchet Abesh (finely chopped lean ground beef), regular Tibs (cubed tender beef), and some sort of creamed corn/veggie. Dessert? We planned on TangySweet but due to metro reasons we stayed in U Street and ended up at Busboys. No complaints here! 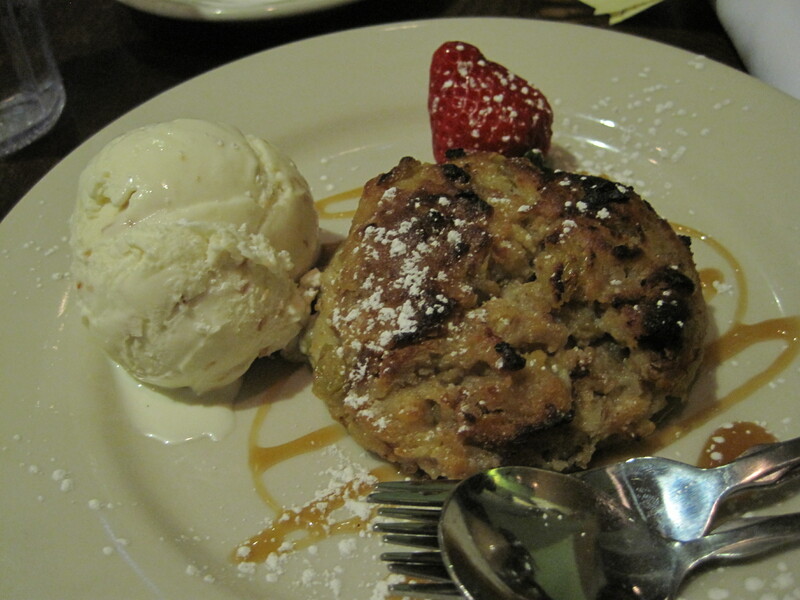 This is their delicious and amazing White Chocolate Banana Bread Pudding with Coconut ice cream. So So So SO good. The bread pudding had that white chocolate taste mixed in with the banana and raisins. I think the raisins turn into a really light caramel color when cooked, yeah? I love how they paired it with coconut ice cream. I would’ve gone more traditional with vanilla. So, I introduced Anita to Ethiopian food and my favorite dessert at Busboys. She called me cultured at first but when I informed her how everyone used that term with me (non-arts friends), she wanted to use a unique term. WORLDLY came to mind… I think that’s a pretty good description. Though, it’s not accurate in traveling terms for me. I must change that. Greece anyone? I give Dukem 3.5 out of 5 for good Ethiopian food, overly sweet wine, friendly staff, a bit crowded, and fast service. I give Busboys & Poets’ dessert a 4.5 out of 5. I haven’t had enough banana bread pudding to crown it with a 5. Hm, I love birthdays, don’t you? 😉 Thanks again for dinner+dessert+good company!